There is something magical about a harpist. The instrument itself provides a fascinating visual backdrop for most social settings, whilst its soothing sound creates a mood of tranquility and harmony – ideal as an unobtrusive accompaniment to conversation. 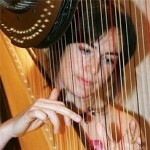 Harp repertoire can cover classical music as well as popular material, and amplification can be provided for larger events. Our harpists are highly trained professionals who present themselves and their material with elegance and sophistication.